In writing this article I consulted senior DEA Special Agents who have worked extensively with the Jungla commandos in Colombia. Their identities have been withheld by request. This post originally appeared at Small Wars Journal, here. The Jungla Commandos, or Compañía Jungla Antinarcóticos (Counter-narcotics Jungle Company; JUNGLA), as they are properly known, are Colombia’s premier national counter-narcotics (CN) interdiction unit. Falling under the Dirección de Antinarcóticos (Directorate of Counter-narcotics; DIRAN) of the Policía Nacional de Colombia (National Police of Colombia; PNC), the Junglas were formed from 120 men in 1989, with the support of both the US and UK. The first course, in 1989, was conducted with training from the British Special Air Service (SAS), although the US Army’s 7th Special Forces Group (7th SFG(A)) provided some behind-the-scenes support and translators. The SAS continued to take the lead until 1991, when US Special Forces took over primary responsibility. In 1998, training responsibility was handed off to the JUNGLA cadre, with ongoing US support. In recent years, training has been supported primarily by the US Drug Enforcement Agency (DEA) and US Army Special Forces. DEA agents embed with the Junglas during High-Value Target (HVT) capture and interdiction missions, as well as providing specialised tactical and firearms training, and the US Army provides specialised land warfare training. Funding comes primarily from the US State Department’s Bureau for International Narcotics and Law Enforcement Affairs (INL) and the Narcotic Affairs Section (NAS) at the US Embassy in Bogotá. The US Department of Defense, Central Intelligence Agency (CIA), Immigrations and Customs Enforcement (ICE), and other US government entities have also been involved in training and providing support for the Junglas. According to sources I spoke with, the Junglas have very little crossover with the Colombian military; however they have conducted some joint operations with the Fuerza Aérea Colombiana (Colombian Air Force; FAC). It is also believed that British MI6 agents (and possibly SAS and SBS personnel) continue to support interdiction efforts in Colombia. The DEA has a specialised jungle group based out of Colombia that operates with the Junglas, the Narco-Terrorism/Jungle Operations Group. The unit is located the Bogota Country Office, and is responsible for DEA activities throughout Colombia. The unit is made up of only seven agents, all with specialised training and/or military experience. Their primary mission is to investigate narco-terrroist organisations such as FARC and ELN. To this end, members collect intelligence, work cases, and produce intelligence packets for capture operations conducted by the Junglas and/or various other Colombian special operations units. They not only work towards issuing US indictments to terrorist targets, but also embed DEA agents with the Junglas during missions, particularly capture missions targeting HVTs, and interdiction missions, such as targeting cocaine processing labs. This allows the agents to assist in conducting Sensitive Site Exploitation (SSE) and intelligence gathering. The DEA also maintains an indicted list of HVTs, including narco-terrorists, who are constantly on the operational target list of the Junglas, and the wider PNC. One of the DEA agents I spoke with indicated that the presence of DEA agents on the scene during these operations contributes significantly to the success of the judicial process. DEA agents operating in Colombia do not have the power to seize assets or conduct arrests, however they may gather information and collect evidence to be used in US courts, or to support global narcotics seizures. DEA Special Agents regularly share intelligence with the PNC and the Departamento Administrativo de Seguridad (Administrative Department of Security; DAS*), the Colombian national intelligence agency. *Please see explanatory update at bottom. The Junglas’ are primarily tasked with CN interdiction missions, particularly those in jungle terrain, where most narcotics production in Colombia takes place. The PNC’s high-risk urban operations are typically handled by the Grupo de Interdiccion Urbano (Urban Interdiction Group). Interdiction missions typically target processing labs, traffickers, narcotics caches, and stockpiles of precursor chemicals. Additionally, the Junglas often conduct raids aimed at capturing HVTs, including designated narco-terrorists from such groups as the Fuerzas Armadas Revolucionarias de Colombia (Revolutionary Armed Forces of Colombia – People’s Army; FARC), Ejercito de Liberacion Nacional (National Liberation Army; ELN), and Ejército Revolucionario Popular Antiterrorista Colombiano (Popular Revolutionary Antiterrorist Army of Colombia; ERPAC). Presently, there are approximately 600 active duty Junglas, divided into three companies, based in the Northern (Santa Marta), Central (Bogotá), and Southern (Tulua) regions of Colombia. There are also approximately 40 members of the Special Reconnaissance Team (SRT), based in Bogotá. This team is comprised of the elite members of the Junglas, and is tasked with high risk reconnaissance, and high risk HVT capture operations. SRT team members have captured a number of HVTs, including Daniel Rendon Herrera (AKA ‘Don Mario’) – Colombia’s most wanted narco-trafficker at the time – in April 2009 , and Marco Fidel Barbara Galacio (AKA ‘Mateo’) in October 2010. Mission intelligence (‘intel packets’ or ‘target packets’) are developed both internally, and with US assistance. CNP anti-BACRIM (bandas criminales emergentes; ‘emerging criminal bands’) units and units from the Dirección Central de Policía Judicial e Inteligencia (Central Directorate of the Judicial Police and Intelligence; DIJIN) develop intel packets on both HCl labs and HVTs for the Junglas. The DEA and the Military Group at the US Embassy in Bogotá (MilGroup; coordinate DoD CN support) also develop intel packets for the unit. The Junglas also have a special unit of the DIJIN attached to them for the purpose of conducting SSE and evidence/intelligence gathering. Members of this Judicial Police unit accompany the Junglas on all operations. The Junglas also specialise in destroying jungle laboratories used for cocaine production. In 2007, they destroyed 850 coca base labs, and 62 HCl labs. HCl labs convert cocaine paste or cocaine base into cocaine hydrochloride, the ‘crystal’ form of cocaine that is most commonly sold illicitly. The vast majority of laboratories producing HCl are located in Colombia. HCl labs can be detected via aerial surveillance, by developing leads from human intelligence sources (HUMINT), or through other, more esoteric methods such as analysing groundwater seepage for chemical content. In 2009 DIRAN seized 92 tons of cocaine and its derivatives, and approximately 84 tons in 2010. So far this year, DIRAN has been responsible for destroying 813 coca base production facilities, and 100 HCl labs. Full statistics can be found on the PNC’s website. 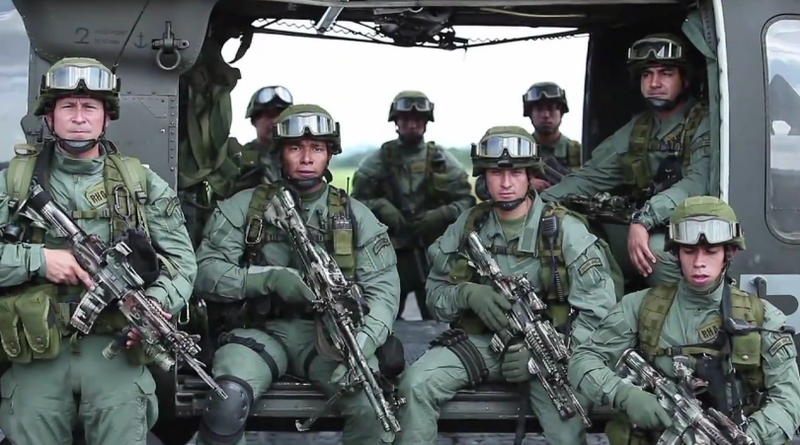 The Junglas are equipped, largely courtesy of the NAS Bogotá, with some of the latest military arms and equipment. The NAS coordinates equipment and training for the Junglas, with this role being managed by Colonel Kevin Higgins for over ten years, until recently. Sources describe COL Higgins as having had “an enormous influence on the Junglas before he left”. With regards to the types of weapons and equipment issued to the Junglas, one DEA official I spoke with described them as carrying “similar armament to the United States Army Special Forces” in that they are equipped with M4 carbines, M16 assault rifles, M9 pistols, M249 light machine guns, M870 combat shotguns, M60 machine guns, Mk 19 grenade launchers, M224 lightweight 60mm mortars, Night Vision Devices (NVDs), handheld GPS devices, encrypted communications, and E&E (Evasion and Escape) survival equipment. Explosive specialists carry C-4 and other demolitions equipment, snipers carry rifles such as the M24, and so on. A number of photos of the Junglas show them using items commonly found in the M4 Special Operations Peculiar MODification (SOPMOD) Block I kit – AN/PEQ-2 laser aiming devices, Trijicon TA01NSN Advanced Combat Optical Gunsight (ACOG) sights, Rail Interface Systems (RIS) kits, as well as other modern equipment such as EOTech holographic sights, SureFire M900 series vertical foregrip-flashlights and so on. Presumably the commonality of equipment between US Army Special Forces and the Junglas enhances the training process. Interestingly, despite this advanced equipment, there are a few recent photos of Junglas using Vietnam-era 20 round magazines with their M4s. The Junglas are organised into ‘airmobile interdiction companies’; most of their raids and assaults are heliborne operations. Organic air support capacity is provided by the Área de Aviación Policial (Police Aviation Area; ARAVI) DIRAN’s assigned subsection of the CNP’s Servicio Aéreo de Policia (Police Air Service; SAPOL). The INL’s Office of Aviation (INL/A) administers an aviation support program for ARAVI, with contractor personnel from Lockheed Martin and Contracting, Consulting, and Engineering (CCE) monitoring USG-supplied assets and providing logistical and technical support. The US has provided approximately sixty UH-60L Blackhawk and UH-1HII Super Huey helicopters equipped with a combination of M134 (GAU/17A) miniguns and M60 and M240D machine guns. 5cm-thick Kevlar plates are fixed to the floor of many helicopters, increasing survivability versus small arms fire from the ground. ARAVI pilots are widely regarded as being some of the most talented rotary wing pilots in the Western Hemisphere. The Junglas are occasionally supported by FAC light aircraft, including a specially-modified C-26 equipped with Forward Looking Infrared (FLIR) cameras and other specialist Intelligence, Surveillance, and Reconnaissance (ISR) equipment. The Junglas Course, conducted by a 60-man training cadre in the Junglas’ training base in Espinal, central Colombia, was first established with the aid of the SAS, and then US Army Special Forces. The intensive, four-month course covers advanced land warfare tactics, jungle warfare techniques, skills specific to CN missions, and survival training. DEA trainers have also helped to develop a live fire rapid-reaction pistol and rifle range at the Facatativa base, and have provided advanced marksmanship training to SRT members. Additionally, each attending Jungla commando is expected to specialise in such disciplines as medical training, sniping, or demolitions. Approximately ten percent of all applicants are successful. Selected Jungla personnel may also be invited to attend the Western Hemisphere Institute for Security Cooperation (WHINSEC) at Fort Benning, Georgia. Each year, participants from around the world are invited to attend the Jungla Commando International Course. The quality of this course has been widely acknowledged; participants have attended from the Infantería de Marina Colombiana (Colombian Naval Infantry; Marines) and Armada Nacional de la República de Colombia (Colombian Navy), as well Argentina, Belize, Bolivia, Brazil, Chile, Ecuador, El Salvador, Costa Rica, Guatemala, Honduras, Mexico, Panama, Haiti, Jamaica, the Dominican Republic, Paraguay, Peru, Uruguay, and, in 2007, Afghanistan. DIRAN and Jungla instructors visited Afghanistan in 2006 to share their experiences in combating illegal crops and narcotics trafficking with various Afghan CN units, meeting with the Afghan Antinarcotics Minister of the time, Habibullah Qaderi, General Sayed Kamal Sadaat, then Afghan Antinarcotics Director, and various members of the National Interdiction Unit (NIU). In October of 2010, the Junglas deployed a nine-man Mobile Training Team (MTT) to Mexico to provide 60 days of CN training on topics such as cocaine laboratory destruction techniques, evidence handling, and chemical safety. Argentinean, Paraguayan, and Brazilian nationals also attended this training. This US State Department cable from October 2009 gives a snapshot of how effective the Junglas can be. In the month covered, the Junglas performed a number of airmobile assaults and raids, killing or capturing several wanted HVTs. Amongst these was a most-wanted FARC criminal, Herier Triana (AKA ‘Patamala’). Patamala was wanted for the kidnapping and subsequent murder murder of the sister of former Colombian President Cesar Gaviria Trujillo, the murder of former senator Jamie Perdomo, and was also thought to be responsible for a series of assassinations committed against a number of town councillors, and a failed plot to kill former Minister of Defense Manuel Santos and his family. In early 2010, the Junglas captured Deiver Luis Durán Caicedo (AKA ‘Morcilla’; ‘Black Pudding’), leader of the BACRIM group ‘Los Urabeños’, who had a 250 million Colombian peso (COP) reward on his head. When I asked one of the DEA agents consulted for this piece where the Junglas fit into the overall interdiction strategy in Colombia, he had this to say: “They are at the top of the list. They are the best in the country and the most specialized, self sufficient unit for interdiction.” He went on to explain that US financial support is now more important than operational support, with the unit having received so much training from the DEA and US Army that it is essentially self-sufficient. A 2008 State Department cable notes that “The high degree of self-reliance and superb Jungla training regimen make the Junglas one of the Embassy’s most effective and nationalized programs… the many Jungla contributions to antinarcotics efforts, both in Colombia and on the international scene, demonstrate the high return that this sustained USG investment continues to yield.” It is clear that the Junglas are extremely successful, certainly the most successful CN unit currently operating in Latin America. You can download a copy of this S3 summary in .PDF format by using the controls above. Update 08/12/2011: During the course of writing this piece (on October 31, 2011), the Colombian government signed Decree 4057, which “suppresses the [DAS] and transfers some functions to other state bodies”. You can find details at the DAS website, here (Spanish). This entry was posted in Counter-Narcotics, Law Enforcement by N.R. Jenzen-Jones. Bookmark the permalink. Commentary on the requirement for Australian Law Enforcement to perform a role similar to the DEA in Columbia, (and Afghanistan for that matter),would make this article more relevant.